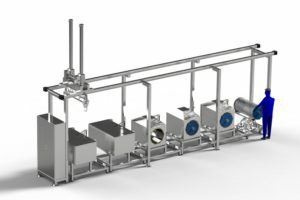 The BioRinse system is designed for liquid treatment protocols such as hot water treatment, rinsing protocols and even “drum priming” like protocols. The system can be configured from manual up to fully automatic with container-container setup. The “base” of the system is a 200L drum. The seeds will stay in this drum during the complete process, the drum travels from the “rinsing” station, to the optional centrifuge and then into the dryer. The seeds will go dry into the system and will come out dry again.